The bus and coach sector can be very cyclical, mainly due to the fluctuating nature of fleet purchasing. Recently declining business confidence and passenger numbers exacerbated a reduction in conventional bus registrations during 2017. 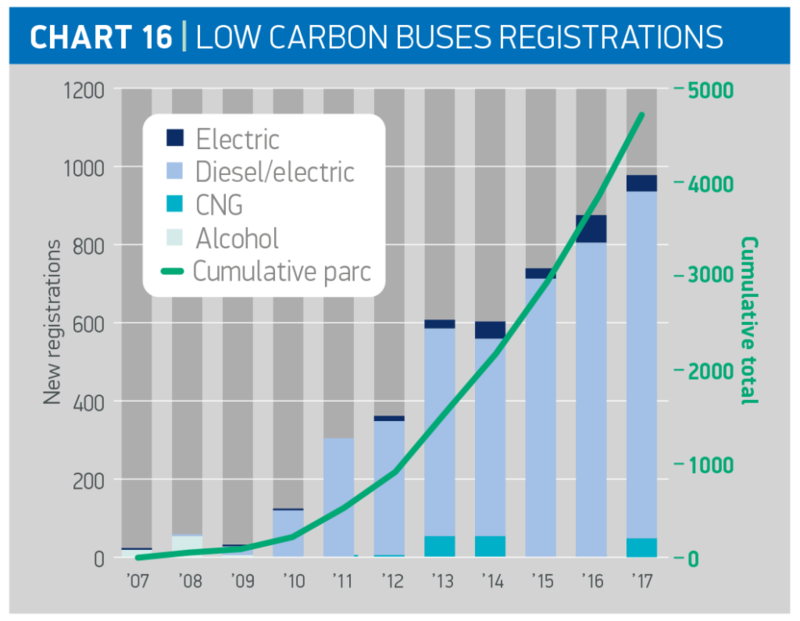 However, the proportion of buses that are alternatively fuelled continues to rise steadily. In 2017, the number of alternatively fuelled buses on UK roads grew to 4,860, accounting for 5.4% of bus parc. Some 90% of the alternatively fuelled parc is diesel electric, 4.7% electric and 3.4% Compressed Natural Gas (CNG). A number of technology companies has also developed retrofit systems to upgrade older buses to the Euro VI standard. These systems have to conform to an accreditation scheme. Additionally, the government is closing the legislation loophole which has allowed the continued registration of Euro V buses in certain circumstances. This should ensure more of the latest low-emission Euro VI vehicles come on to the roads and improve air quality in towns and cities. Unlike cars and vans, buses and coaches do not face tailpipe CO2 regulations, but are often regulated by the local authority or city which as part of the appointment of an operator to a route, requires the vehicle to meet certain standards, including those relating to the environment. Buses are one of the key components to solving the air quality issues in urban areas. Real world tests using the London 159 bus route equipped with Euro VI technology show a 95% drop in NOx compared with previous generation Euro V buses. Consequently, if every older bus operating in the capital was replaced with a Euro VI version, total NOx emissions in London would fall by 7.5%. Therefore, it is important that these policies pull in a common direction rather than create a patchwork of differing requirements, which make it difficult for manufacturers and operators to plan and bring to market effective solutions. Broader policy considerations, including better planning and suitable infrastructure provision, could also help ensure modal and technological shifts can be delivered. The UK charging infrastructure is growing rapidly with new charging points installed daily, reaching 14, 800 connectors in 5,100 locations by the end of 2017. Government is encouraging the charging infrastructure to grow with various incentives for public, home and workplace charging. Government recognises that public charging remains crucial, thus has set out new measures in the Automated and Electric Vehicles Bill (AEV Bill), including a requirement for large forecourts and motorway service areas to provide charging infrastructure. To ensure further growth, a coordinated approach is needed between all relevant stakeholders and the government to plan for roll-out and overcome barriers jointly. It must involve vehicle manufacturers, charge point manufacturers/suppliers, network operators, energy retailers and distributors, local authorities, fleet operators, fuel retailers and highway authorities. Ionity, backed by Ford, BMW, Daimler and Volkswagen, to provide Electric Vehicle (EV) ultra-fast 350kW chargers at 80 of its biggest roadside filling stations. Ionity targets 400 sites across Europe covering 18 countries by 2020. E-STOR, which collaborates with Renault to enable the installation of rapid electric vehicle charging on sites where connection capacity would be a constraint, using second life batteries to supplement energy supply. Government investment of £30 million in Vehicle-to-Grid(V2G) technologies (Feb 2018). By the end of 2017, 11 hydrogen-refuelling stations (HRS) were publicly accessible in the UK (see Chart 17, below). They were developed with the help of government’s Hydrogen for Transport advancement Programme (HyTAP), which provided £5 million. In March 2017, a further £23 million funding from government was announced, which will support hydrogen vehicle and infrastructure development. The existing stations are geographically located to support vehicle manufacturers’ initial fuel cell electric vehicle (FCEV) launch plans and are a significant first step towards building the national network of 65 stations proposed by UK H2 Mobility.